Thinness and the use of space. 3 watches with no room for error. As the title hints, these watches are interpretatively near perfect, or have extremely low tolerance for mistakes in manufacturing. Case in point, these 3 watches in the selection are the ultrathin Bulgari Octo Finissimo Tourbillon Automatic, the Seiko Presage SJE073, newly resized with a thinner caliber and the highly engineered Ferdinand Berthoud FB 1R chronometer which uses a tourbillon Fusee Chain movement. Bulgari’s Octo Finissimo Tourbillon with a self-winding mechanism and an ultra-thin movement. 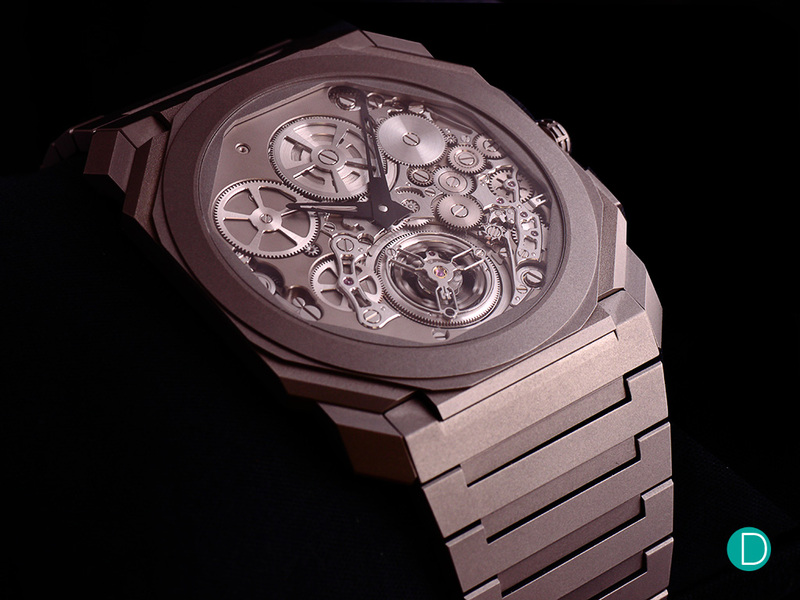 The movement, complete with a tourbillon measures just 1.95mm. At just 3.95mm thick, the Octo Finissimo Tourbillon Automatic claims a new watch industry record for the fourth time. The watch is fascinating to hold and observe, considering how this 1.95 mm thick movement houses not only a tourbillon, but also an automatic winding mechanism. Working on the basis of the Finissimo Tourbillon movement launched in 2014, this new development – Calibre BVL 288 – handles automatic winding via an innovative and attractive peripheral oscillating weight positioned on the back of the movement. The movement also incorporates a flying tourbillon equipped with a ballbearing system. 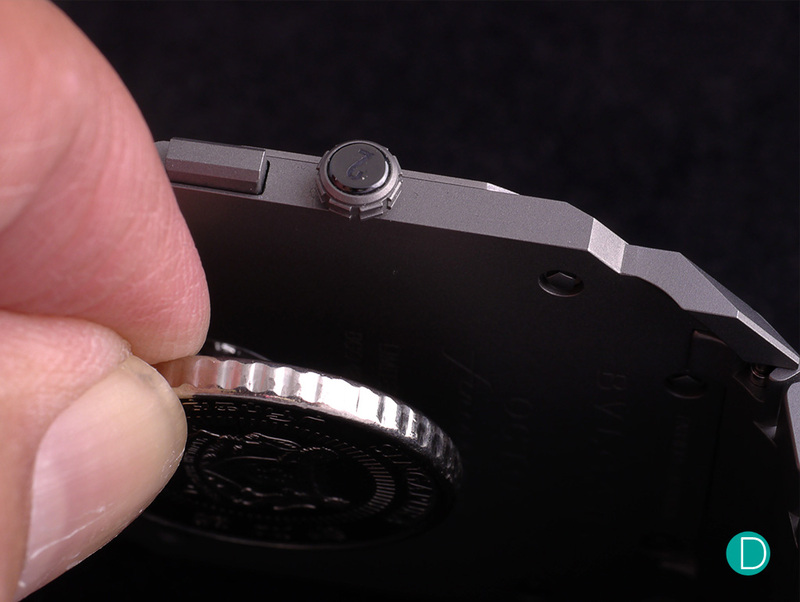 When cased, the watch measures just 3.95mm, just a little thicker than a $0.50 coin. Considering the thinness of the case and movement, manufacturing parts and integration of the pieces must have been extremely difficult, with low tolerance for error. The Calibre BVL 288 Finissimo is equipped with 52 hours power reserve and is housed in a sandblasted titanium case revealing the entirely openworked skeleton movement. Given Bulgari’s display of engineering finesse and modern design with the Octo, the collection can now be testament of the brand, with a rhetoric against lazy re-editions or vintage themes. The updated Seiko Presage SJE073 with a new caliber and a thinner profile. 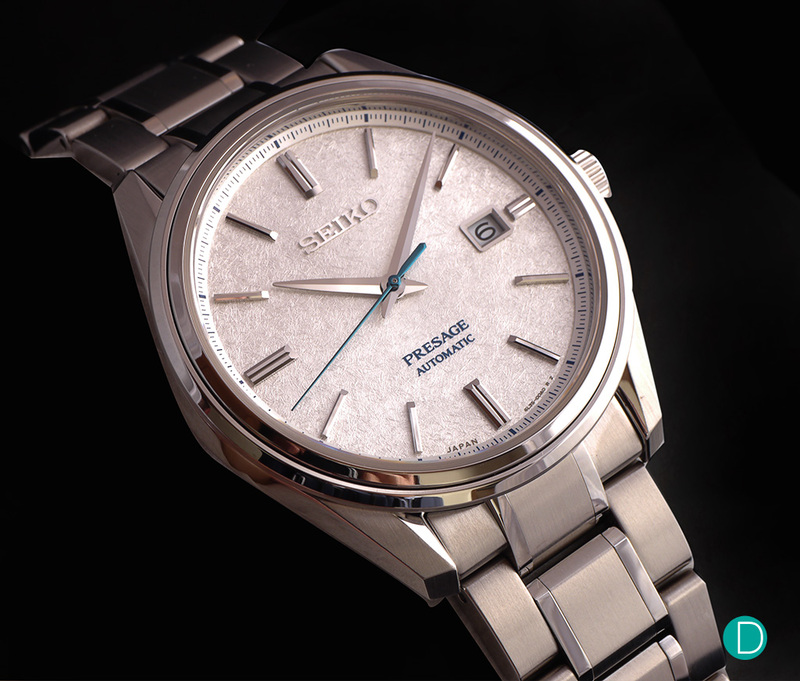 It looks just like any other Presage, and bears some resemblance with the Snowflake dial Grand Seiko SBGA011. Nothing out of the norm, and in fact, it looks identical to the 2017 SARX055 “Baby Snowflake”. Now here’s the catch. The 2018 SJE073 has a new caliber. The caliber 6L35 that slims the profile of the watch to under 10mm. 9.8mm to be precise. Top that off with a stainless steel case and bracelet with a “super hard coating”, zaratsu polished and a still good-looking textured dial. It’s a beautiful watch no doubt, and limited to 1881 pieces. The only qualm however, is how it is priced at €2200, almost twice the older SARX055’s retail price but looks almost identical to it apart from the 1.3 mm thinner profile. A great offering by Seiko, and a subtle reveal of what is to come with thinner movements, the potential for slimmer and more proportionately sized classic style watches. 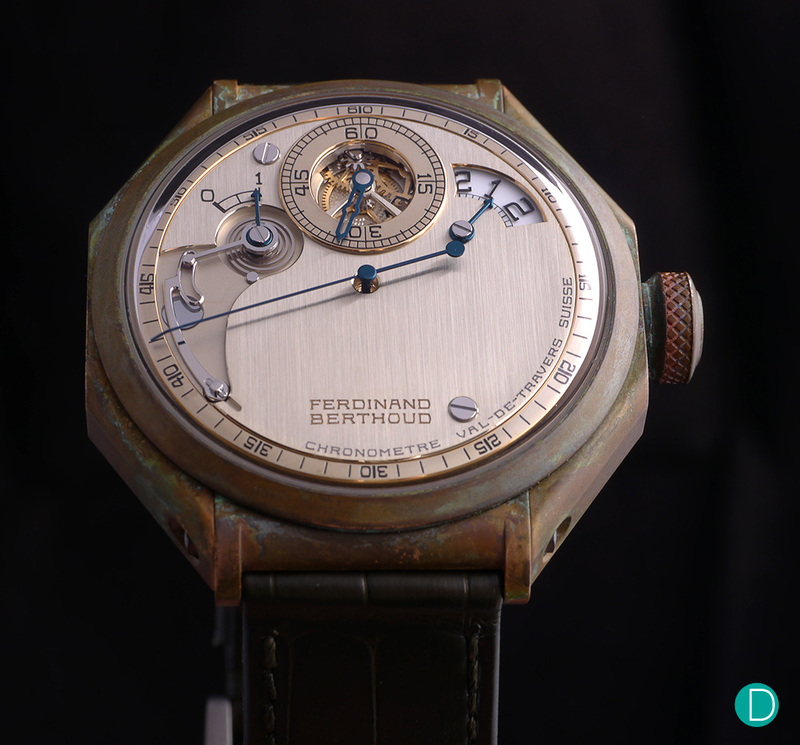 Ferdinand Berthoud with the newly launched Chronometer in bronze. The Ferdinand Berthoud Chronometer is given a new case material in bronze with 5 unique pieces the FB 1R.5-1 to FB 1R.5-5. While this may seem at first glance, a gimmick given the perceived popularity of bronze watches, the case material used on the chronometer however, is thoroughly appropriate, given the strong nautical theme the watch gains its inspiration from. Each of the 5 regulator models are uniquely patina treated, off a beadblasted case made entirely of bronze. While subjective, the dial is also appealing in its use of negative space, and a intricate dial display. While the case material is the novelty for the 2018 release, the watch itself while same as before, is still a stunner. The case design is unconventional and houses portholes at 2 and 11 o’clock for the viewing of the Fusee and Chain mechanism. The fusee and chain transmission system is the oldest solution for ensuring a constant-force supply of energy to the escapement. Partnered with a tourbillon visible from the back of the case, the movement is a chronometry standard and a display of engineering prowess.